This new website and branding has been a long time coming. I am grateful to the folks at String Marketing for helping me bring my vision to life. Through a series of interviews they helped me nail down my messaging and produce a brand that I couldn’t be happier with. One of my biggest objectives was to add some sort of tagline that captured my philosophy and treatment approach. Emily Fonnesbeck, RD is pretty vague. I consider myself to be a different kind of dietitian; one that is much more concerned with how you feel about food than the food itself. The words that kept coming up as we discussed how I would want my clients to feel were “well nourished” and “confident”. 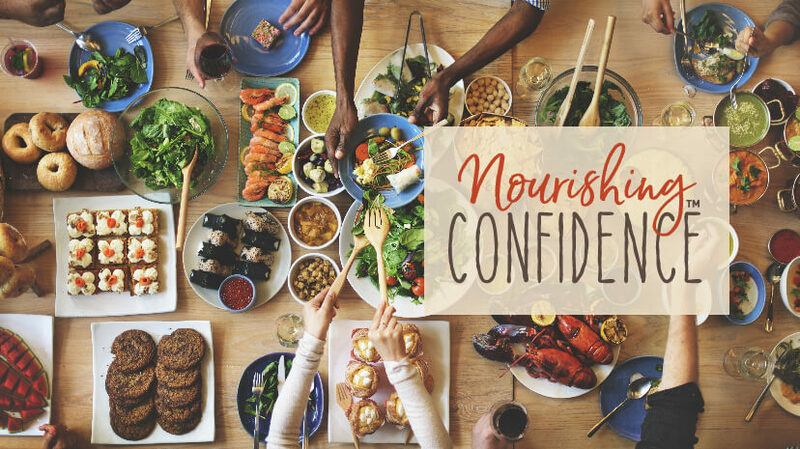 As such, Nourishing Confidence was born, which I feel perfectly describes what I hope to help you do with food and body image. Nourishing confidence means reconnecting with that part of you that knows when, where, and how to eat for not just maximum health, but maximum empowerment. You were born with an amazing body that communicates it’s needs to you. However, every diet or food rule you’ve tried hijacks that natural intuitive process. The problem isn’t, never was, nor ever will be, YOU. You are perfectly capable of knowing how to eat and your body is perfectly capable of self-regulating weight and I want to help you embrace that. The fear or trepidation you feel towards embracing a non-diet, weight-neutral approach is understandable. We live in a society that has taught you not to trust your body or yourself with food. Making peace with food and your body requires you to be brave. It means going against the food rule, the eating disorder and what everyone else is doing. It takes courage to do what you know needs to be done, especially as you feel the anxiety that inevitably results. It’s very possible to feel the fear while still connecting with your wise, healthy and intuitive mind. What is it telling you? What do you need? Is it an extra slice of bread? Is it sleep or some relaxation? Is it to get up and move in a way that feels enjoyable rather than punishing? To leave a triggering conversation or unfollow an unhelpful social media account? Maybe a pep talk and some self-compassion instead of beating yourself up? Perhaps better boundaries in relationships? Avoiding the scale or any type of body checking? The way you nourish confidence is by practicing the courage to give yourself what you already know you need. It’s hard to overcome habitual patterns, food fears or body preoccupation on your own. You need support and it would be my absolute pleasure to help. While private consultations are the best way to do that, I also hope to offer support through the blog. The blog will now be known as FOODTUITIVE, as a reminder to you that eating doesn’t have to be complicated or intimidating. You know how to be intuitive with food. Becoming Foodtuitive means embracing a healthier perspective and embarking on the journey to unlock freedom while caring for your body in a natural and healthy way. The blog is a place to find advice, inspiration and tools to make positive changes in your life, starting today. I hope you’ll comment, share and let me know what you think. Thank you for being part of a message and mission that I am passionate about, it means so much!